“These are not the streets of Paris, London, or New York. 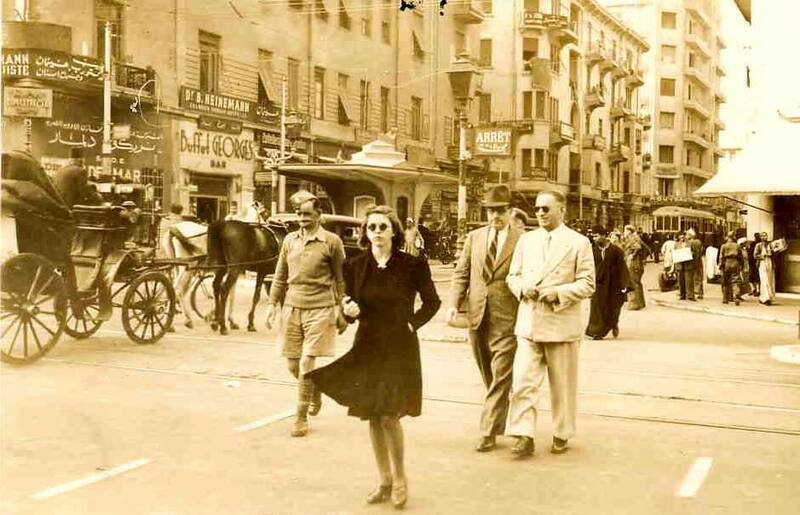 This is an image from 1941 at Emad El Dine street in Cairo. During this bygone era, women were not afraid to walk in the streets. Garbage did not form mountains on every corner. Grey, uniformed apartment blocks and thick smog did not obscure the sun’s light. And how were the ordinary people of Egypt, who could not afford to walk in the fashionable Cairo streets, getting along in those bygone days of King Farouk and British colonialism? well ofcourse not everyone was fashionable and dressed in such ways… but it seems there was room for it. Andrea, no I don’t, but I’ll do some research if you like! My interest comes from a conversation with a friend and her Mum here in Jordan. They were saying that it’s only been in the last 20-30 years that most women have started wearing the head scarf here in Jordan and I was interested to see some photos of those times. I found one on the internet of Women in Kabul, Afghanistan in the 70’s and they are wearing miniskirts – definitely not what you think of when you hear about Kabul. Very interesting, thank u Andrea!